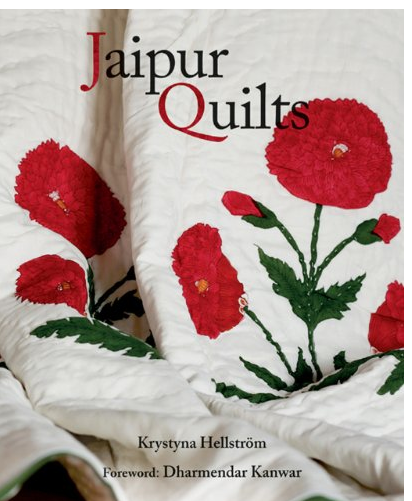 Last week I finally picked up Krystyna Hellstrom's Jaipur Quilts. For the book, textile designer Brigitte Singh agreed to be interviewed and allowed Hellstrom to photograph her workshops (in fact, a Singh quilt made the book's cover). So that was the initial draw. But flipping through the pages I soon became aware of many more Jaipur-based quilt makers. Hellstrom's focus is on Indian-owned textile houses (or in the case of Singh, a French ex-pat who married into an Indian family). For me, Hellstrom's own striking photos are one of the main strengths of the book. They convey a range of styles, from contemporary patterns by young Indian designers to gorgeous antiques, and show the craftsmanship behind these typically whisper-light yet warm covers. Although several of the oldest quilts highlighted are intricately stitched white on white, the majority of pieces Hellstrom documents are block-printed natural fiber fabrics filled with specially carded (think fluffed) cotton. A European-born quilt connoisseur traveling through Jaipur, Hellstrom met with both the old and new guards. Kitty Rae falls somewhere between the two. According to Hellstrom, Rae began the commercial production of quilts after Independence, in midcentury India, 1963. So this year marks her business Kin Fabric's 50th anniversary. Because she began on a small scale, printing out of her home and reviving a traditional Indian craft, it seems to me Kitty Rae's enterprise was in line with Gandhi's vision for the country. Cobalt-blues with green on a fresh white ground are seen throughout Hellstrom's photo album of Kin wares. If you're planning an expedition to Jaipur, the book has a traveler's guide bent to it and shop addresses are included. 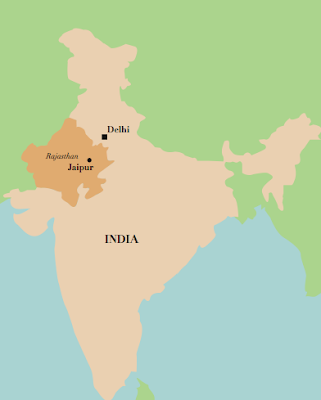 Just know that while Anokhi shops and the Anokhi Museum of Handprinting are mentioned in the resource section, the author opts not to cover either in any detail. But Kadar Bux, Magic Quilts, Lashkari Textiles, Rajasthan Fabric and Arts, Rasa, Soma, and Madhurima Patni, aka Gitto, founder of Surabhi Exports, are discussed. You just turned that one into a "must buy" for me! greens on an off white ground--I cannot think of anything more enchanting at the moment! Your discerning eye has triumphed once again. These colors do feel refreshing right now, and I'm happy to help spread the word about all the beautiful quilts in Krystyna's book! Jacqueline -- I think you'll appreciate it! seule771 -- you're kind. Thank you so much.